When the weather turns cold, a good beef stew is on the menu in our house. This very easy winter dinner is perfect for warming up when temperatures fall. 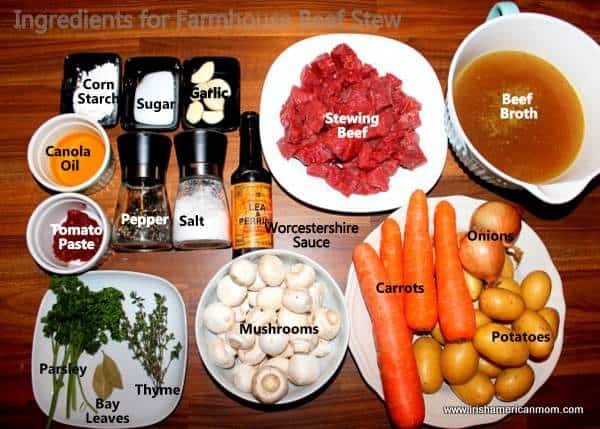 Since the mercury has dropped so low in many parts of the eastern United States this week, I thought it would be the perfect time to share my farmhouse beef stew recipe. 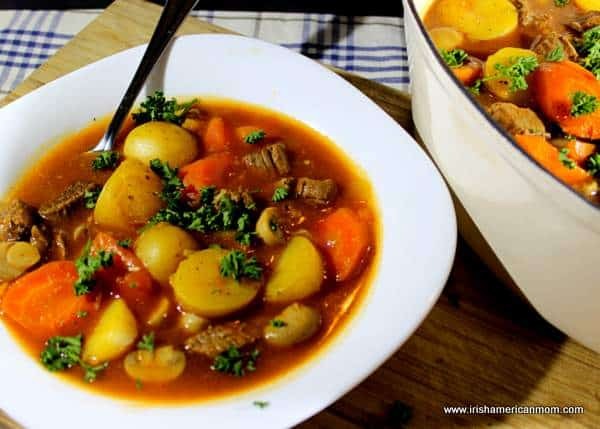 This is not a spiced up, or boozed up stew, but a more traditional recipe that featured frequently on the menu of my Irish childhood. In the past I have shared my Guinness Beef stew, but I rarely had alcohol enhanced stews as a child. That would have been an expensive luxury few Irish homes could afford back in the 1970’s. So this stew is made with no red wine, beer or Guinness. The vegetables I use are carrots, potatoes, onions, garlic and mushrooms. But other vegetables like parsnips, or diced rutabaga can be used, or towards the end of cooking a few peas can be added for a splash of green color. 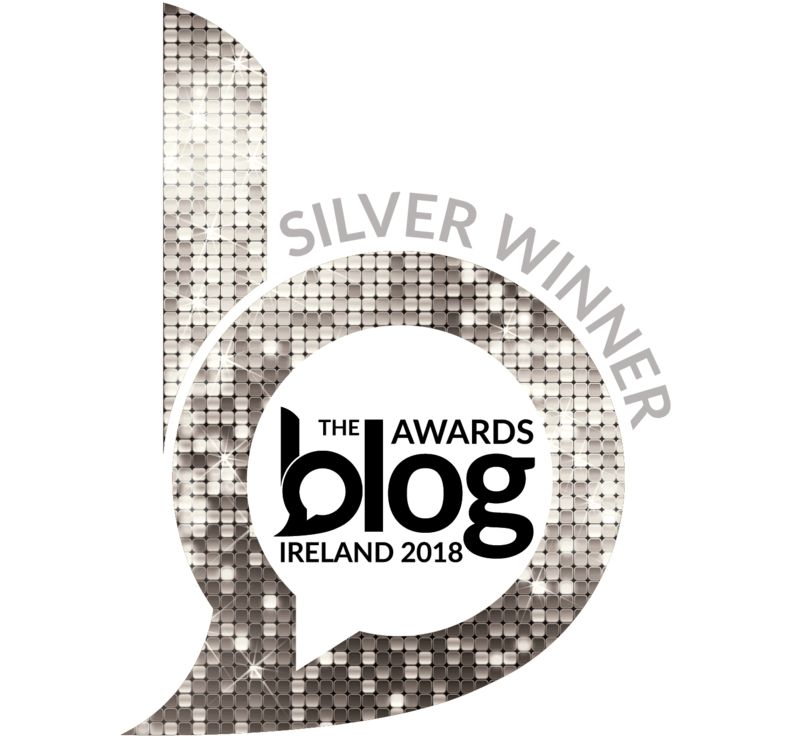 The herbs are simple – thyme and bay leaves. 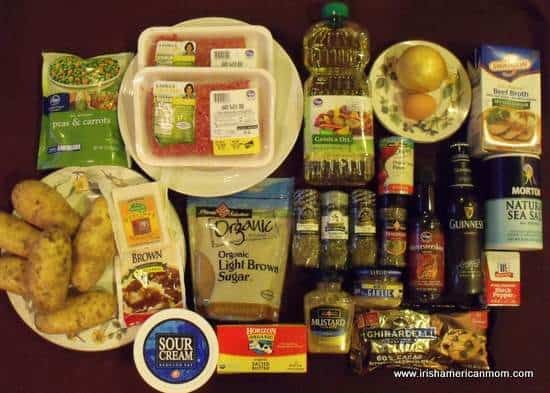 The flavors are subtle, typically Irish and definitely not hot and spicy like many stews from other countries and cuisines. The perfect accompaniment to Irish stew is Irish brown bread, of course. I like a hunk of buttered bread with my stew when potatoes are included in the stew. Otherwise I love to eat stew with mashed potatoes. 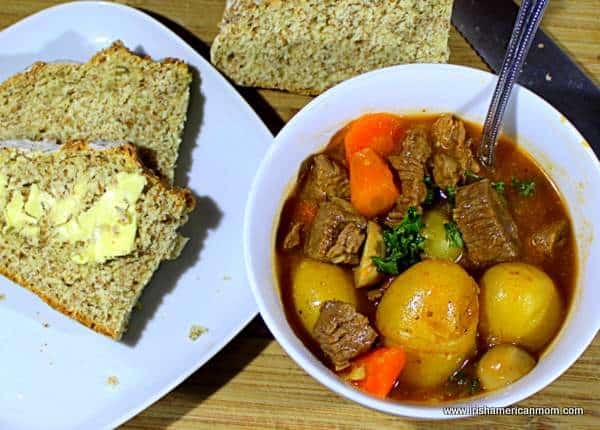 I suppose this really is an old fashioned beef stew, but let’s face it, I’m starting to be a bit old fashioned myself these days and I still love this taste of my Irish childhood. 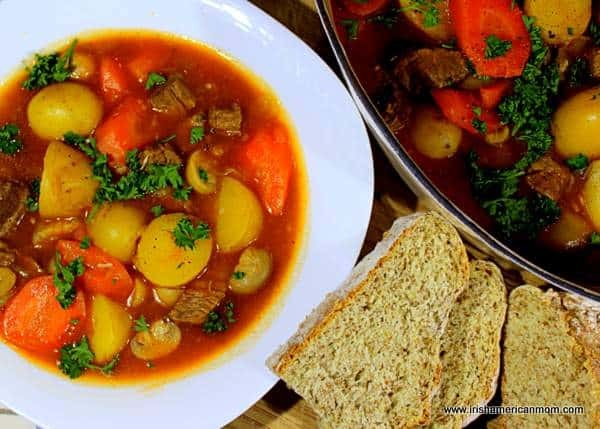 Now traditional Irish stew is usually made with lamb or mutton, but many Irish cooks use beef for a delicious cold day meal bursting with fork-tender vegetables and luscious beef. This is what I call real comfort food. 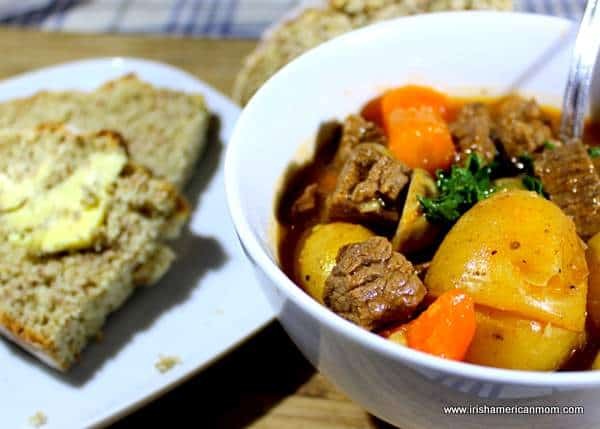 We Irish really know how to make great stews. Our rural forebears were experts at one-pot cooking when a bastible hung over an open fire and a complete meal was cooked slowly throughout the day. 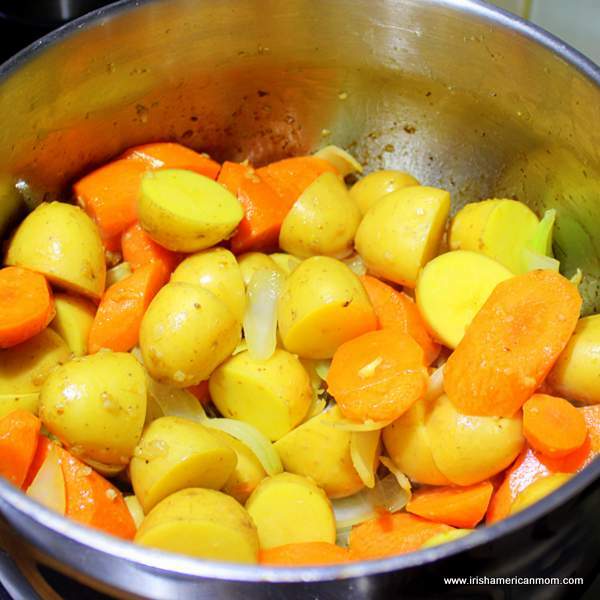 I love to savor a stew on cold evenings, especially after being outdoors for a hill walk or after an Irish soft day. 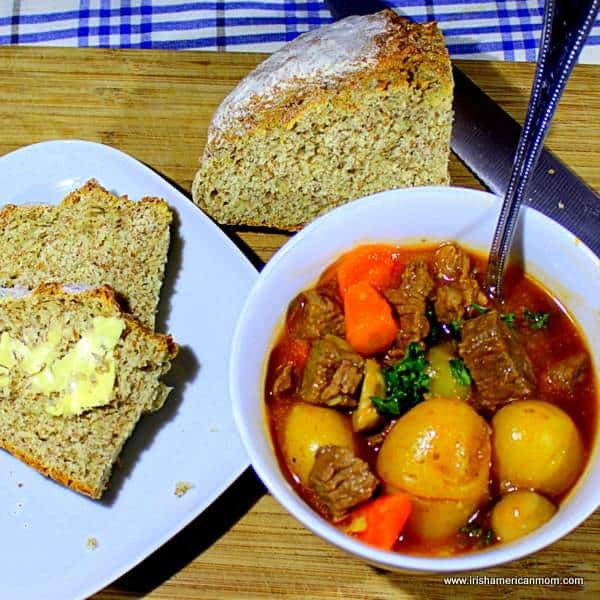 And so, without further ado, here’s my recipe for a good farmhouse beef stew, Irish style. Start by preparing the vegetables. I like to leave the skins on the baby potatoes. They’re nutritious and very tender when cooked slowly. If you are using bigger potatoes with thicker skins, then peel them first before cutting them in to smaller pieces. Next I peel and cut the carrots. I used 4 medium sized carrots for this stew. 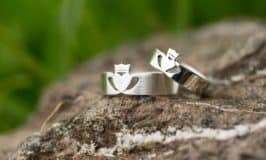 I like to cut them on a diagonal about 1 inch in length. I peel the onions and cut them in eighths. My husband doesn’t like onions and when they’re left in pretty big pieces it’s easy to spot them and remove them from his portion. Clean the mushrooms too. I use small button mushrooms for this stew. They absorb the flavors without losing their texture. Heat half the oil in a large stewing pot and add about one third of the beef. Brown it on all sides. Make sure you don’t overcrowd the pot with beef pieces. They need a little space for the oil to seal them. 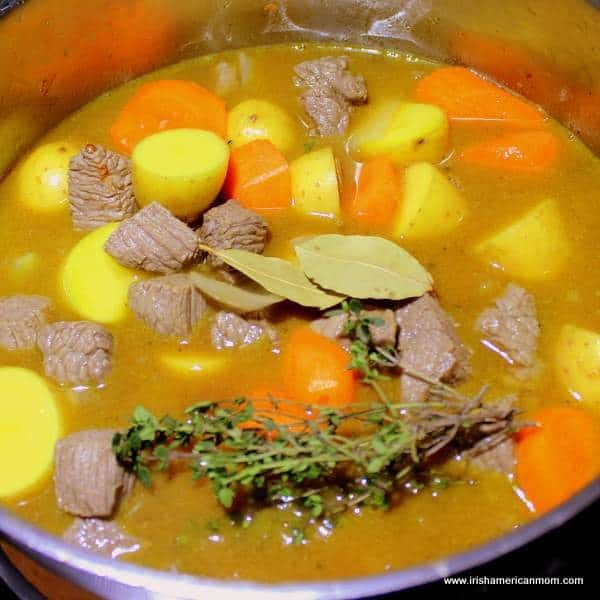 Make sure the beef is well browned since the browning residue at the bottom of the pot is what will add some color to the beef broth. 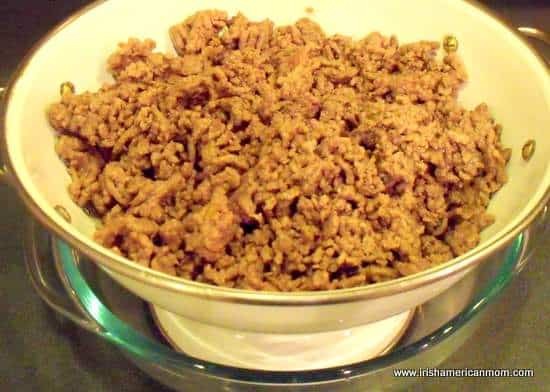 Remove the first batch and repeat until all the beef is browned. Set the browned beef to the side. Add the rest of the oil to the pot and loosen the beef residue with a spatula. Add the garlic and onions and toss in the oil. Cook for 2 to 3 minutes. Next add the carrots and potatoes and toss them with the onions and garlic to coat them in oil. Cook for a further 2 minutes over medium heat. Return the beef to the vegetables in the pot. Next add the beef stock, together with the tomato paste, sugar and worcestershire sauce. Stir gently to mix. Add the thyme and bay leaves. These will be retrieved at the end of cooking, before serving. Set the heat at low and let the stew simmer slowly. After about 1 hour, add the button mushrooms. I halved some of the bigger mushrooms to keep them all about the same size. Continue to simmer over low heat for another 2 hours. Once the stew is cooked it’s time to thicken the broth. I like to use corn starch (or cornflour as we call it in Ireland). 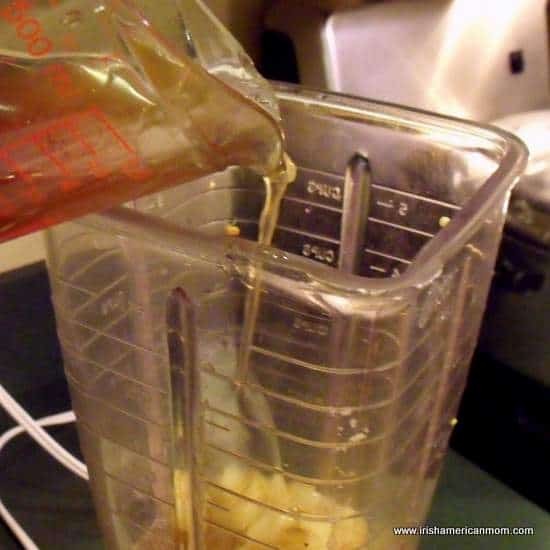 Mix the corn starch with cold water and blend it completely so there are no lumps. Add this slurry to the stew and stir. Let it cook for a further 10 minutes over a slightly higher heat so the corn starch can complete its thickening magic. Never make a corn starch slurry with hot liquid – it will become lumpy. 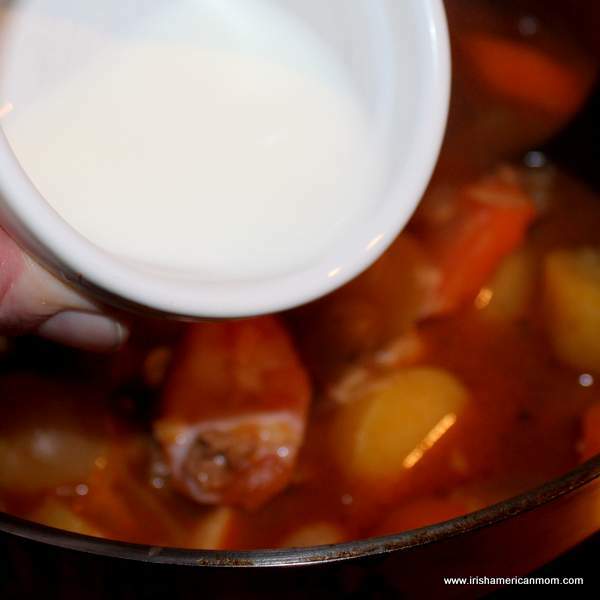 Many stews are thickened using a flour based roux, or by coating the beef with seasoned flour before browning. I prefer to use corn starch for this particular stew. The beef is just lovely without the extra floury coating. Once the stew has thickened you’re ready to start plating. Remove and discard the thyme sprigs and bay leaves before serving. Sprinkle some chopped parsley on top to add a little splash of color and extra flavor. And don’t forget a hearty, rustic bread on the side. This is a stew best served in a bowl with a spoon and a fork. The fork can be used to mash the potatoes into the juices, but a spoon is definitely required to slurp up all the lovely, heart warming broth. 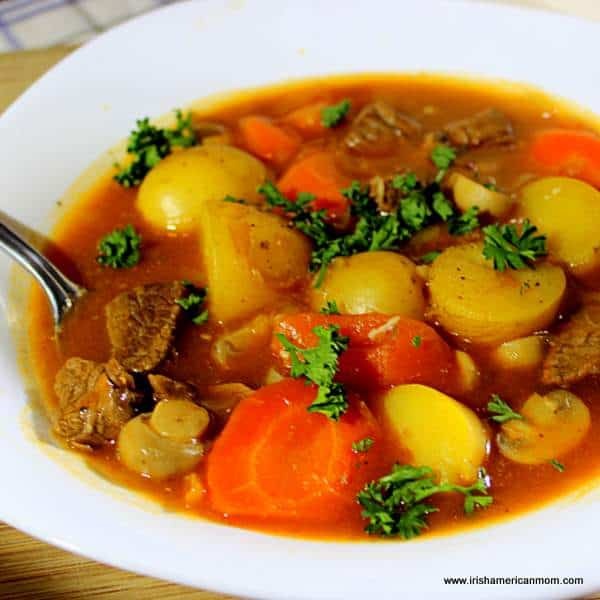 An Irish farmhouse beef stew with onions, garlic, carrots, potatoes and mushrooms, with thyme and bay leaves as herbs. 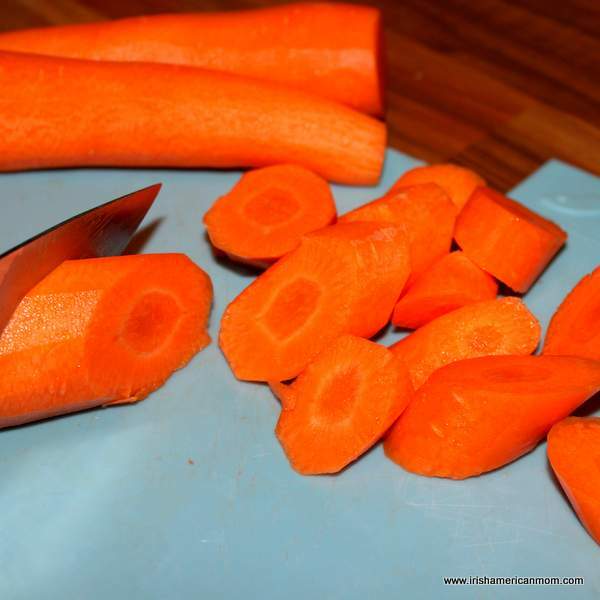 Peel and cut the carrots into 1 inch cubes. Wash the potatoes, and clean the button mushrooms. Peel and cut the onions into eighths. Heat half the oil in a large stewing pot. Add one third of the beef and brown on all sides. Remove from pot and repeat with the remaining two batches of beef. Set the beef to the side. Add the remainder of the oil to the pot. Add the onions and garlic and sweat for 2 minutes. Add the carrots and potatoes and toss with the onions to coat in oil. Sweat for a further 2 minutes. Return the beef to the vegetables in the pot. Add the beef broth, the tomato paste, sugar and worcestershire sauce. Add the thyme and bay leaves. Bring to a boil then reduce to a low heat and simmer for one hour. Add the mushrooms. Simmer for an additional hour. Make a slurry by blending the cornstarch and 3 tablespoons of cold water. Stir into the stew. Increase the heat to medium and simmer for a further 10 minutes to thicken the broth. 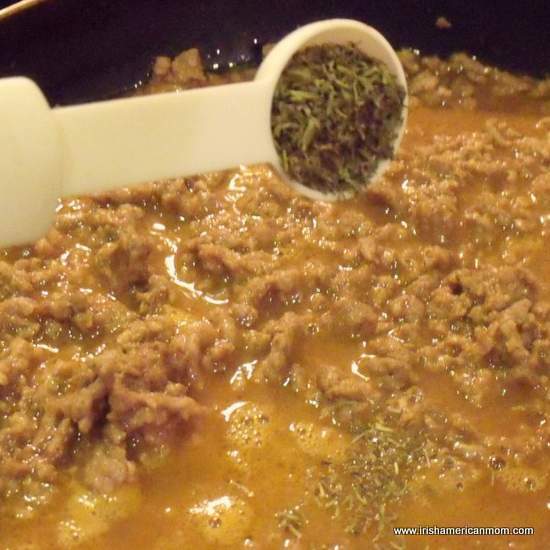 Remove the thyme and bay leaves before serving. Serve in bowls with a side of rustic bread. And there you have it – my simple farmhouse beef stew. Wishing you all happy stew making over the coming cold winter months. 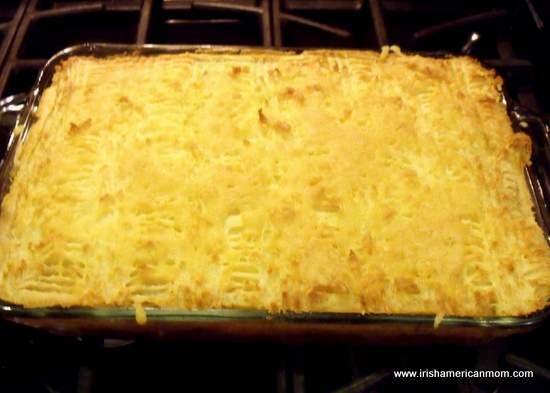 Shepherd’s pie may have originated in England, but it was adopted by Irish people many years ago. I grew up eating shepherd’s pie. To give my version of this traditional dish a true Irish flair, I have added Guinness stout to the beef mixture. Shepherd’s pie is comfort food at it’s finest, especially when it has a little Irish flavor thrown in. Hope you enjoy my version of this delicious main course. Before I start cooking the beef, I usually peel and cube my potatoes, cover them with water and set them to boil in a large saucepan. Add some salt to the cooking water. If you peel your potatoes in advance of cooking the meal, do not add salt until you plan to cook the potatoes. 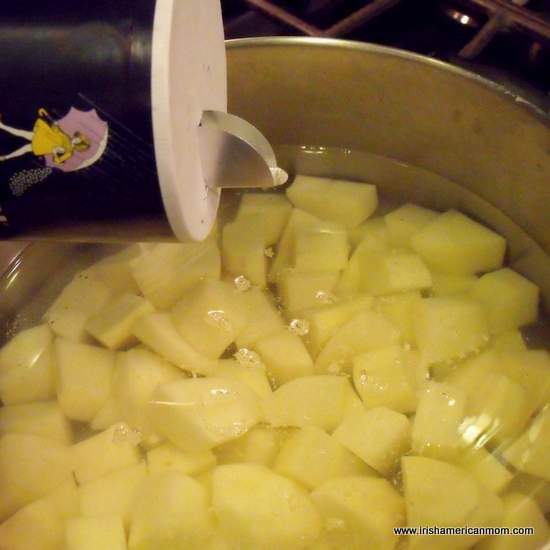 Salty water draws the juices out of potatoes, if they are left to stand too long before cooking. Once the water is boiling, reduce the heat to a simmer. After 15 to 20 minutes they should be fork tender and ready to be drained. While the potatoes are boiling, season the beef with salt and pepper. Heat 2 tablespoons of oil in a large skillet. Brown the beef in two to three batches, depending upon the size of your skillet. 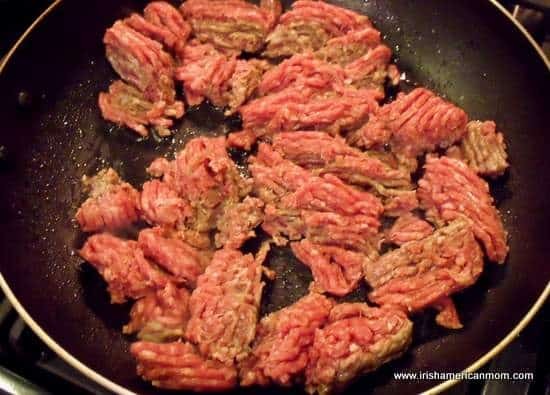 Make sure the beef is fully browned before turning into a colander to strain the excess fat. I like to sit my colander over a glass bowl to collect the excess fat and juices. I then soak it up in paper towels and throw it in the trash. Our water company has requested we limit how much meat fat gets put down the drain. Meat fat can easily clog plumbing pipes. While the meat is sitting to the side, add the last tablespoon of oil to the pan and brown the onions and garlic in the skillet. 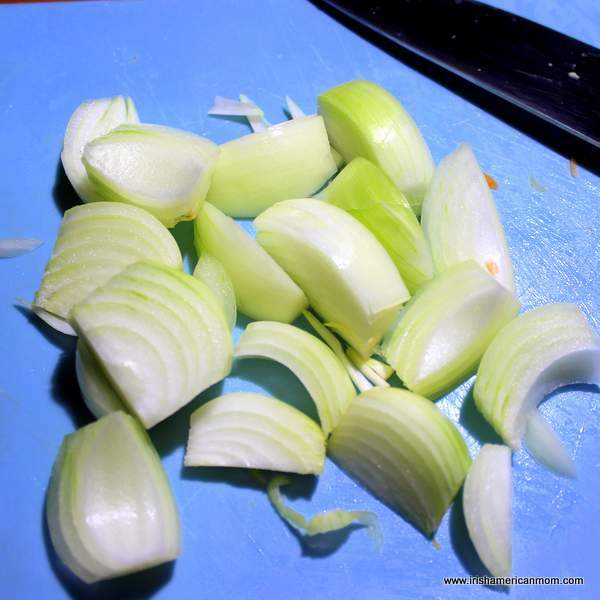 My husband does not like the texture of onions, so here is a little trick I use to include their vital flavor, but eliminate the texture he so detests. I put the fried onions, garlic and the beef broth in my blender, then liquify the onions. I know most gourmet chefs are probably cringing at this idea, but a girl’s got to do, what a girl’s got to do, when her man doesn’t like onions!!! 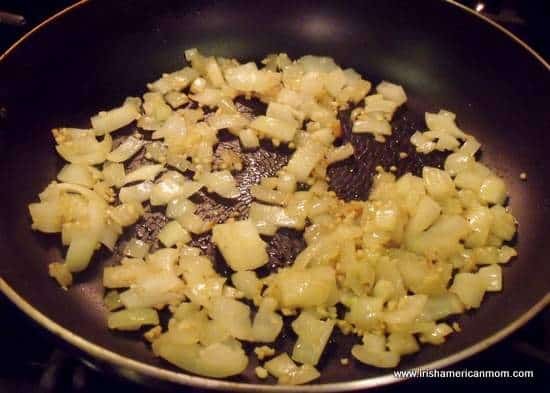 Return the beef to the skillet with the onions (if you have not liquified them). Next add the tomato paste and dijon mustard. Pour the Guinness and Worcestershire sauce into the meat mixture. Add the beef broth, or in my case, the beef broth and pureed onions. The broth in this picture looks more like Guinness because of the frothy, liquified onions. Stir the liquids well through the meat mixture. Spices are next. Toss in the thyme, parsley, sage and marjoram. Another quick stir is needed to disperse them throughout the beef broth. Brown sugar helps to take away some of the bitterness of the Guinness. A few bittersweet dark chocolate chips are my secret weapon, to enhance the depth of the Guinness flavor. 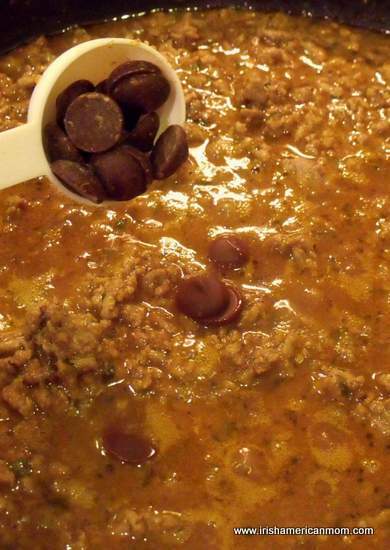 Mix well to ensure the chocolate melts and melds throughout the skillet. Return the mixture to the boil, then turn the heat down to low and allow to simmer for 20 to 30 minutes, until the mixture is thick and glossy. While the meat mixture is simmering, the potatoes should be tender. 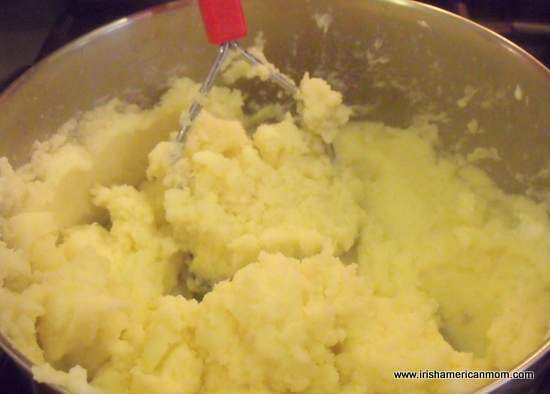 Strain the potatoes, then mash them, or pass them through a potato ricer. I use a good old-fashioned potato masher. You can use a hand mixer, but be careful not to over-beat these starchy, russet potatoes. They can get gluey if the starch is released by over-beating. Add the butter and 1/4 cup of sour cream to start. Mix thoroughly with the masher, and add extra sour cream as needed to produce a smooth potato mixture. The exact amount is dependent upon how starchy your particular potatoes may be. 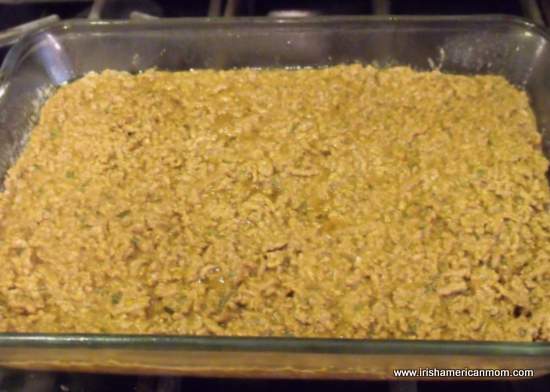 When the meat mixture has thickened nicely, pour it into the bottom of a greased 2-quart glass baking dish. My dish is 8″ x 11″. Top the meat layer with thawed peas and carrots, spreading them evenly over the surface of the meat. Next comes the potato layer. Spoon the mashed potato over the vegetable layer and spread gently over the top, trying not to disturb the lower layers. When evenly spread, cross hatch the surface with a fork. Place the shepherd’s pie in an oven pre-heated to 350 degrees F. Cook for 15 minutes before adding a layer of grated cheese. 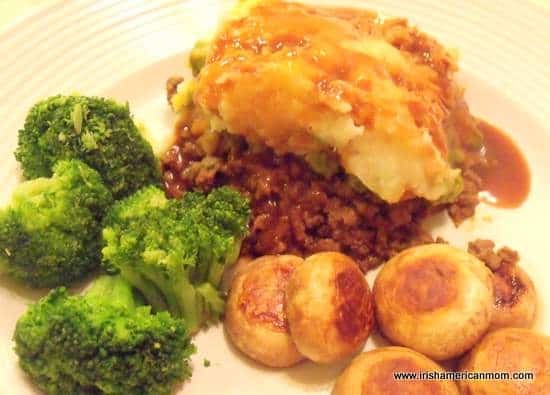 If you wish to prepare this dish in advance of cooking, you can cover and store a pre-made shepherd’s pie in the fridge for a day prior to cooking. If you are cooking it after taking it out of the fridge, remember to extend the cooking time to one hour, since it will not be going into the oven hot. My favorite white cheddar is Kerrygold’s Dubliner cheese, which is available here in the United States. 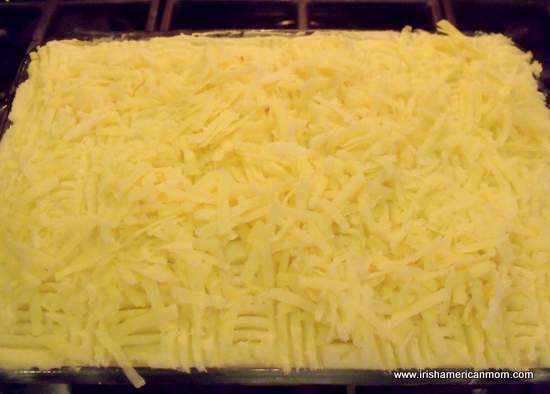 After 15 minutes of cooking I remove the casserole dish and spread the grated cheese over the top of the potatoes. Reducing the time the cheese is in the oven eliminates the risk of the cheese burning before the pie is fully cooked. Return to the oven and bake for a further 20 to 30 minutes. 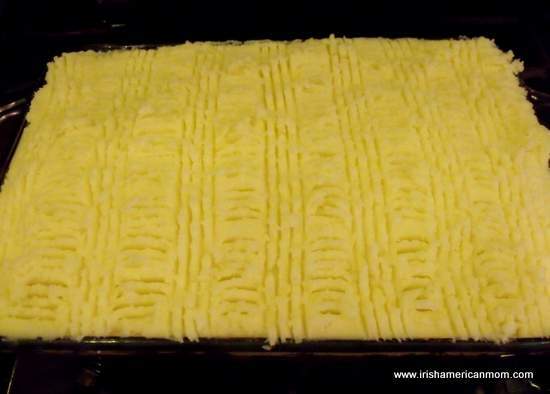 The shepherd’s pie is ready when the surface is golden brown and crisping at the edges. Remove it from the oven. While it is cooling, there is plenty time to make a little Guinness gravy to accompany it. Add the brown gravy packets to the water in a saucepan and whisk together to eliminate all clumps. Add tomato paste. Then comes the Worcestershire sauce. And then the key ingredient, the last 3 ounces of Guinness remaining in the bottle. I hate waste, so I decided why not use the last few drops of Guinness to enhance a little gravy to accompany this dish. Add a teaspoon of brown sugar and whisk the gravy as it comes to the boil. Keep stirring it to prevent any lumps. Remove from the heat once it starts to bubble. I like to serve my shepherd’s pie with a little Guinness gravy poured over the top, some steamed broccoli and a few mushroom caps, sauteed in oil and a dash of worcestershire sauce. Shepherd’s pie is one of our family’s favorite meals. 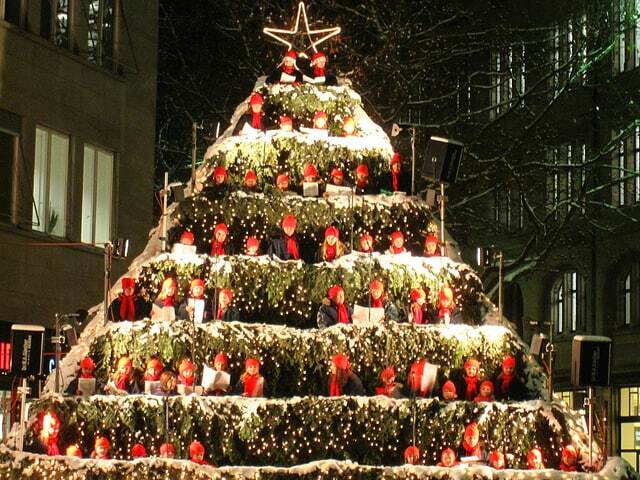 I hope you and yours enjoy it as much as we do. Shepherd’s pie is comfort food at its finest and originated in England. 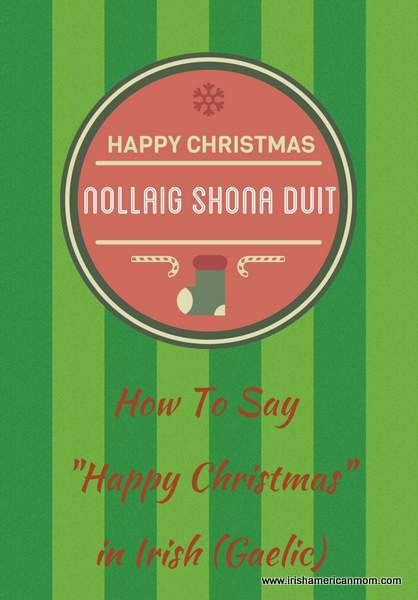 Irish people adopted it many years ago. To give my version of this traditional dish a true Irish flair, I have added Guinness stout to the beef mixture. Step 1 Peel and cube the potatoes and place them in a large saucepan. Cover them with water. Turn the heat on high and set them to boil. Add some salt to the cooking water. Once the water is boiling, reduce the heat to a simmer. After 15 to 20 minutes they should be fork tender and ready to be drained. Step 2 While the potatoes are boiling, season the beef with salt and pepper. Heat 2 tablespoons of oil in a large skillet. Brown the beef in two to three batches, depending upon the size of your skillet. 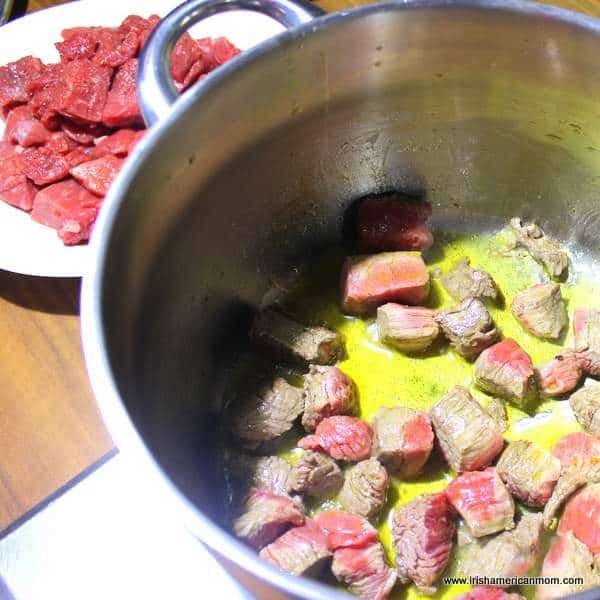 Strain the beef through a colander to drain off the excess fat. Set aside. 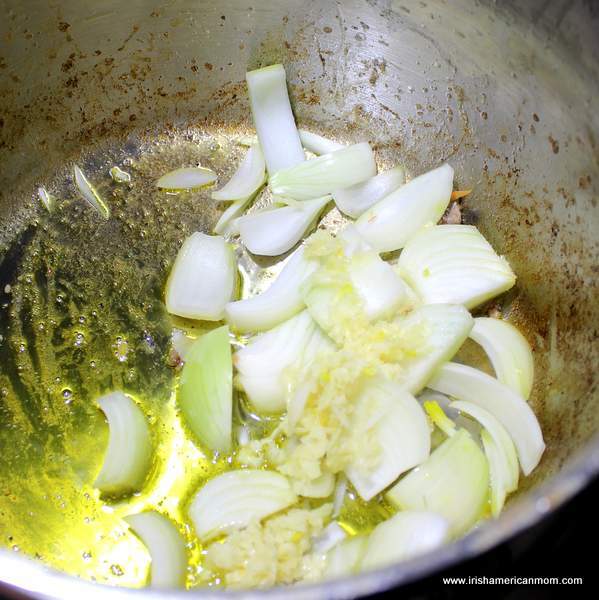 Step 3 Add the last tablespoon of oil to the pan and brown the onions and garlic in the skillet. Step 4 Return the beef to the skillet with the onions. Next add the tomato paste and dijon mustard, the Guinness, worcestershire sauce and beef broth. Stir well. Step 5 Add the thyme, parsley, sage and marjoram. 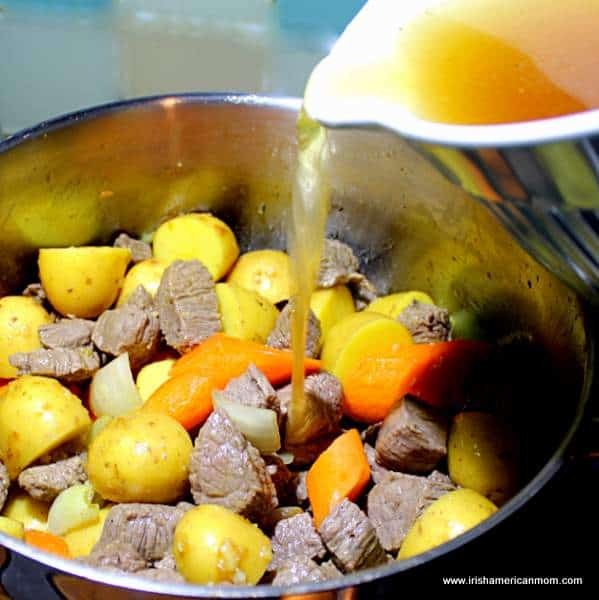 Stir to disperse them throughout the beef broth. Step 6 Add the brown sugar and chocolate chips. Stir well to ensure the chocolate melts and mixes throughout the skillet. Return the mixture to the boil, then turn the heat down to low and allow to simmer for 20 to 30 minutes, until the mixture is thick and glossy. Step 7 While the meat sauce is reducing over low heat, strain the potatoes when tender. Mash well or pass them through a potato ricer. Add the butter and half the sour cream. Mash thoroughly, adding additional sour cream as necessary to smooth the consistency of the mashed potatoes. 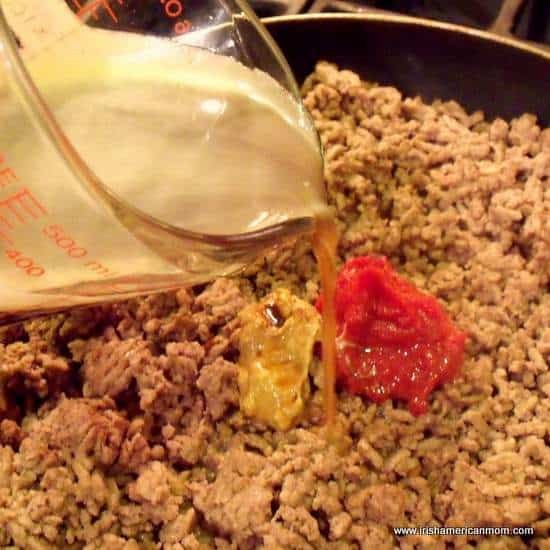 Step 8 When the meat mixture has thickened nicely, pour it into the bottom of a greased 2-quart glass baking dish (8″ x 11″). 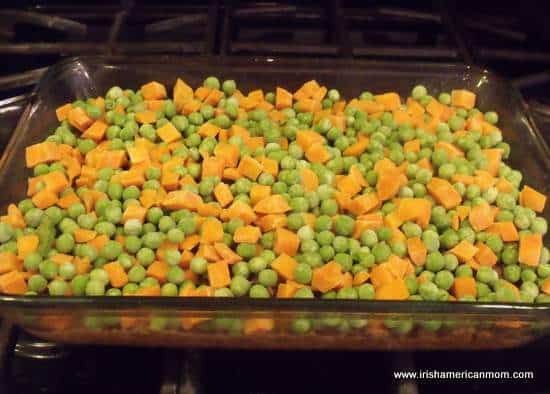 Top the meat layer with thawed peas and carrots, spreading them evenly over the surface of the meat. Spoon the mashed potato over the vegetable layer and spread gently over the top. Step 9 Place the shepherd’s pie in an oven pre-heated to 350 degrees F. Cook for 15 minutes before adding a layer of grated cheese. Return to the oven and bake for a further 20 to 30 minutes. 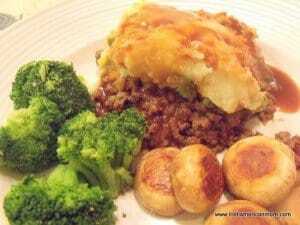 The shepherd’s pie is ready when the surface is golden brown and crisping at the edges. Remove it from the oven. While it is cooling, make some Guinness gravy. Step 10 Add the brown gravy packets to the water in a saucepan over high heat. 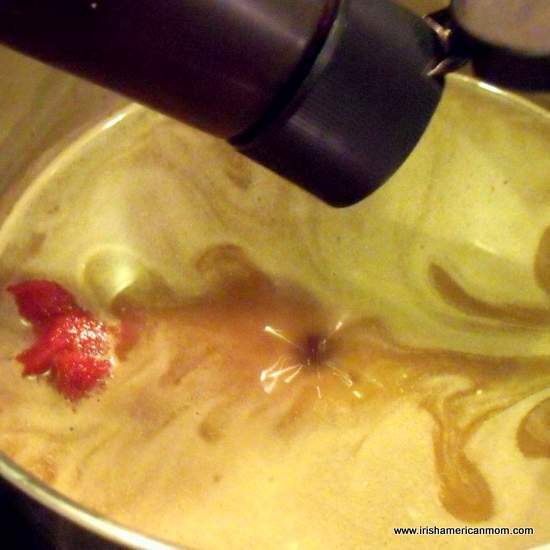 Whisk in tomato paste, worcestershire sauce, Guinness and brown sugar. Keep whisking the gravy as it comes to the boil. Remove from the heat once it starts to bubble. Step 11 Using a metal serving spatula, divide the shepherd's pie into 6 to 8 rectangular servings. 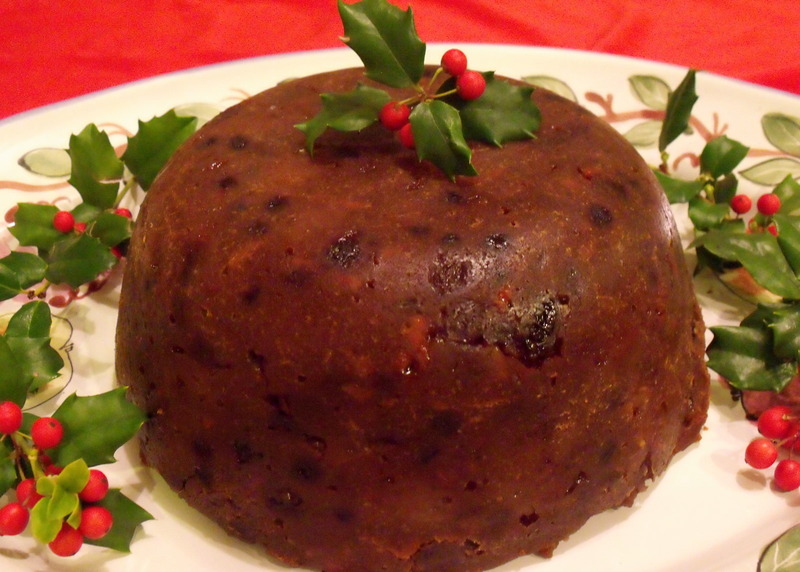 Serve with gravy poured over top, if desired. P.S. The folks at Kerrygold have never heard of me. I just love their cheese, and thought I might share with you. 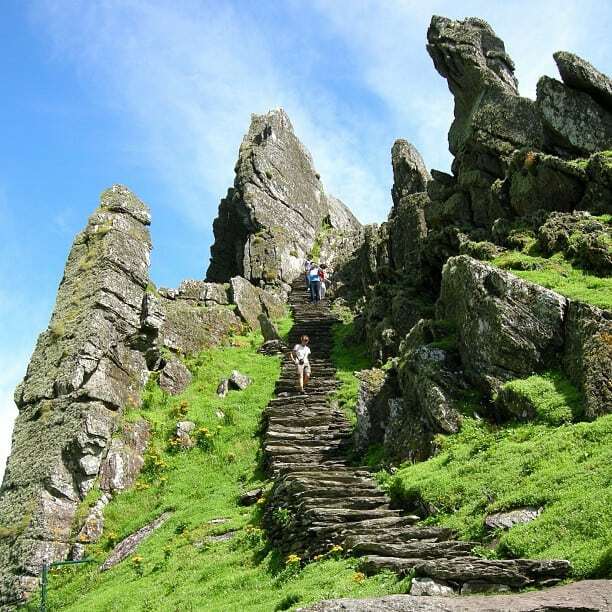 It brings back memories of my childhood, and the sweet, nutty flavors of Irish cheddar cheese.